It’s a moment most dream of but few ever come close to attaining. For a sport with the global pull of football, only a select number are deemed good enough to play it professionally. Fewer still represent their country at the elite level. Indeed, some of the finest professional footballers in history have never even participated in a World Cup. Of those fortunate enough to represent their nation on football’s grandest stage, a minute number have hoisted the famous gold trophy. And, of course, there are the unique few who have etched their name in the annals of football and changed their lives immeasurably by scoring the winning goal in the final. Some are unexpected heroes. Uruguay’s Alcides Ghiggia snatched away Brazil’s destiny in 1950 and his shock winning goal caused the infamous Maracanazo disaster, which still resonates in the South American nation. Geoff Hurst only made it into England’s team because of an injury to Jimmy Greaves, yet his hat-trick won the Jules Rimet trophy in front of the adoring Wembley public. Although Diego Maradona dragged Argentina to the final in 1986, it was the more understated Jorge Burruchaga who clinched their second title with Argentina’s third against West Germany in Mexico. Mario Götze was a substitute in the 2014final, before his delightful volley brought Germany their fourth crown. For others, immortality is not just envisioned, it is demanded. As he was raised aloft on teammates shoulders and draped in the Brazilian flag, Ronaldo realised he had secured his legacy and delivered that immortal moment. 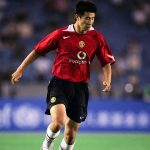 His double against Germany in Yokohama’s International Stadium in 2002 was a cathartic release of stress and pressure. It was quite the contrast from four years earlier in Paris. A buzz generated throughout the Stade de France. Whispers and giddiness turned to disbelief and shock. The assembled press had been handed the team sheet just over an hour before the World Cup final would commence. The French team of Zidane, Thuram, Blanc, Barthez et al was as expected. The Brazilian line-up was in the same vein, with the exception of one slot up front. Ronaldo, the superstar of the Brazilian squad, the greatest player in the world, was absent. The 1998 World Cup was supposed to be Ronaldo’s crowning glory. A part of Brazil’s World Cup winning squad in 1994 as a 17-year-old, his career graph was on a continuing upward trajectory. Beginning his European club career at PSV Eindhoven, Ronaldo scored 54 goals in 57 appearances for the Eredivisie club before the age of 20. From there, he moved to Bobby Robson’s Barcelona. 47 goals and a year later, he moved to Internazionale for a then world record transfer fee of £19.9 million. He scored a further 34 goals in his maiden season in Serie A while Inter to UEFA Cup glory. In his first 44 internationals for Brazil, he scored 28 times. He won successive FIFA World Player of the Year awards in 1996 and 1997. He won the Ballon d’Or, too, as well as securing the Golden Shoe for Europe’s top league goalscorer. Ronaldo had a combination of electric speed, raw power, close control, intelligent passing and destructive finishing. His trademark acceleration and nerveless ability in one-on-one situations facilitated his astounding goalscoring record. In his first five years as a professional, Ronaldo scored 207 goals. At 21, he truly was a phenomenon, from which his nickname would be adapted later. When American sports manufacturers Nike first got involved in football in the early ’90s, they figured Brazil would be the country to showcase their brand to a worldwide audience. It was a sound ploy. Brazil and their mystical samba soccer evoked the passions of football fans across the globe. The yellow and blue kit was as synonymous with the game as their expressive, joyful style of football and the colourful, eccentric supporters that followed them everywhere. Despite winning the 1994 World Cup in a fashion unbecoming of the great Brazilian sides, the manner of their win and the more defensive nature of their play didn’t dissuade Nike. They were still world champions and they had world football’s biggest star. Nike looked upon Ronaldo as football’s Michael Jordan and they paid him accordingly. The Brazil-Nike deal signed in 1996 was the most lucrative sponsorship in football history at that time. The Brazilian Football Federation would receive $160 million in exchange for the national team wearing the brand. Ronaldo was their poster boy, featuring on billboard and television advertisements in the lead up to the tournament in France. Under the guise of their 1970 World Cup winning coach Mário Zagallo, Brazil were expected to romp to a fifth world title, and they reached the final as many envisioned. Ronaldo continued to live up to his own billing, scoring four goals as the host nation waited in the showpiece event. On July 12, 1998, the day of the final, the anticipation was that Ronaldo would achieve what he appeared destined to. To everyone’s disbelief, something strange occurred in the period before kick-off, though. The initial story fed to the media was Ronaldo was struggling with an ankle injury, followed by an upset stomach and fictitious rumours surrounding his love life. Team doctor Lidio Toledo eventually revealed that Ronaldo had been rushed to hospital suffering from convulsions in his sleep but had been cleared to play after a medical examination. Ronaldo indeed played, but his influence was non-existent. He slowly hopped around the pitch, a forlorn and ghostly figure. In truth, Brazil was never a match for France on the day. Zinedine Zidane’s headed double gave the defending champions an almost insurmountable obstacle to overcome. Marcel Desailly’s second half sending off offered Brazil a brief avenue back into the game, but without their talisman in shape, they rarely looked like scoring. Emmanuel Petit sparked scenes of jubilation in Paris with France’s third in injury time, but the juxtaposition to the home country’s celebrations was the image of a desolate Ronaldo gazing exhaustedly at his opponents with his Nike boots tied around his shoulders. In the years following France 98, Ronaldo suffered two knee separate knee injuries and missed the guts of two seasons of football. The player was at the peak of his powers in 1998, but the World Cup final and the incident that day began a downward spiral. The sheer number of matches and time Ronaldo missed raised doubts about his future. Even if he played again, many suspected injury or fitness would hamper any chance of personal or collective success for Brazil. The longevity of Ronaldo’s absence from football was a source of sadness for a nation. The summer of 2002 would change all that. The World Cup is different. Football is widely regarded as a global sport, but the World Cup is truly the event that captures the imagination and attention of everybody. The 2002 edition, the first held in Asia, saw Brazil looking to recapture the crown they lost four years earlier. Brazil struggled in their qualification campaign and were in danger of missing the tournament altogether. Luiz Felipe Scolari took the job with five games in qualifying remaining and they eventually made it to football’s grandest stage. Ronaldo had missed the entirety of the qualification rounds and had barely played in over two years. Scolari was prepared to take a gamble and named their star player in his World Cup squad. The hopes and fears of a nation again rested on Ronaldo’s shoulders. Regardless of his lack of minutes, Ronaldo was determined to make amends for 1998. Brazil were unfancied, but the components of their team still stood out. They had two outstanding full-backs in Carlos and Cafu, a midfield of dependable solidity with Kléberson and Gilberto Silva, but most of all a superstar frontline of Rivaldo, Ronaldinho and their returning predator. With the ‘Three Rs’ in tow, Brazil blazed through the tournament with application and flair. They beat China, Costa Rica, Belgium, England and Turkey to reach yet another final. Ronaldo quickly dispelled any injury worries, rediscovering his scoring touch almost immediately. In fact, he notched up goals against each of Brazil’s opponents apart from England, a game remembered for David Seaman’s crushing mistake from Ronaldinho’s free-kick. Scolari’s team were in the final in Yokohama. Their opponents would be Germany, an equally unfancied but equally efficient side with the best goalkeeper in the tournament, Oliver Kahn. As Ronaldo bestrode the Japanese turf, he was patently aware of the pressure, but also the opportunity. The final was played at a methodical pace, with neither side willing to commit too many men forward in the early minutes. Germany clearly missed their key midfielder Michael Ballack, suspended for garnering two yellow cards. A pattern quickly developed, namely Ronaldo duelling with Kahn. The German number one had conceded just one goal in the entire tournament – scored by Ireland’s Robbie Keane – and he seemed impenetrable. Ronaldo grinned widely when shaking Kahn’s hand after the national anthems, but that smile would turn to a frown. Ronaldo would continue to shoot and Kahn would continue to thwart him. The Brazilian thought he had scored, sprinting onto Ronaldinho’s scooped pass only for Kahn to smother his finish. Ronaldo patted Kahn on the back only to receive a stern glare in return from the Bayern Munich colossal. The sides were still level well into the second half. Germany seemed prepared to accept extra time and penalties with the knowledge that Kahn would likely edge the odds in their favour. In the 67th minute, Rivaldo let fly with his left foot. Inexplicably and cruelly, Kahn spilled the shot and Ronaldo pounced to put Brazil in front. If his first goal was rather scrappy, the second was far more ‘Brazilian’ in its nature. Kléberson drilled a pass from the right, Rivaldo allowed the ball to move past him and Ronaldo controlled and side footed past Kahn. Ronaldo wheeled away in celebration wagging his finger, his gap toothed cheeky smile revealing an inner satisfaction. It was his eight goal of an astonishing tournament. The remaining minutes of the game ticked away and Brazil were in the unusual position of revelling in the final stress free moments of victory. Referee Pierluigi Collina blew his whistle for full time and a sea of yellow erupted in unison. Players, substitutes, coaches, supporters, family and friends hugged, kissed and cried tears of joy. And Ronaldo was front and centre, grinning from ear to ear, after one of the great comebacks. His personal nightmare had become a dream.